Ford Co-Pilot 360 is available with the XL trim and standard with the Lariat and XLT. What is Ford Co-Pilot 360? It is a suite of driver-assist technologies that provide you with outstanding protection. 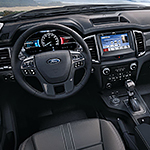 The Ford Co-Pilot 360 features a Blind Spot Information System with Cross Traffic Alert, Pre-Collision Assist With Automatic Emergency Braking, a rearview camera, automatic high-beam headlights, and more. The SYNC 3 infotainment system comes equipped with the Ranger. This infotainment system includes Apple CarPlay, Android Auto, an eight-inch touchscreen, pinch-to-zoom technology, and two smart-charging USB ports. The voice-activated Navigation system featured with the SYNC 3 makes it easy to reach your destination.